G6DS ultra-slim relay for high density monitoring in industrial control equipment. 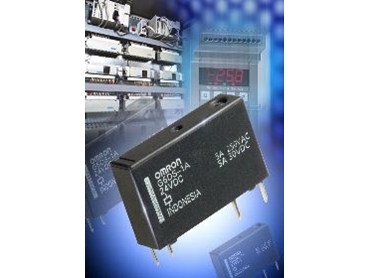 OMRON Electronics has introduced an ultra-slim relay capable of handling loads of up to 5A and offering high sensitivity for industrial control equipment. The G6DS-1A/1A-H is slimmer and lighter than the G6D relay. With a 5mm width and miniature size (20.3mm x 5.08mm x 12.5mm), it significantly reduces board space, making it suitable for high-density mounting in a variety of applications including Programmable Logic Controller (PLC) based industrial process controllers, distributed I/O control systems, timers, temperature controllers and control boards. The G6DS is a single pole relay with a rated coil voltage range of 5Vdc, 12Vdc and 24Vdc, allowing up to 100,000 operations with a resistive load of 5A at 250Vac/30Vdc. It has a coil power consumption of 180mW as standard and a highly sensitive coil type (120mW) is also available. The relay has a fully sealed enclosure and a SPST-NO configuration. It satisfies VDE (EN 61131-2 and EN 61010) reinforced insulation requirements and conforms to UL 508/CSA C22.2 standards. In line with Omron’s policy for all new and existing components manufactured after April 2005, the new relay is fully RoHS compliant.